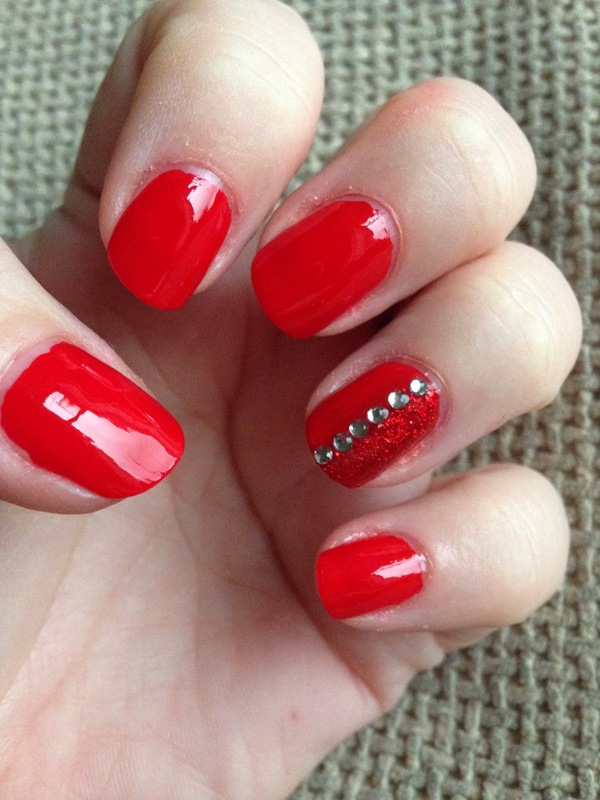 Today I have number 5 for you in my easy Christmas nail ideas series, today's look is red with sparkle and diamonds and is the most tricky of the nail looks so far in this series but it wasn't very complicated to do, and as I always say, if I can do it, you can do it. As always I shall show you the products used, the finished look, how I created the look and then a mini review of each product used with where to buy links. I won't be including the Orly Bonder Base Coat and Orly Glosser Top Coat in my review and where to buy section as it is the same base and top coat used in each post and as I reviewed them in number 1 of this series which will be linked below, I didn't want to repeat myself in each post by reviewing them in every post in this series. First of all I applied 1 coat of my Orly bonder base coat to my nails, I then applied 2 coats of the Orly Haute Red polish allowing each coat to dry in-between, I could have used only 1 coat of this polish as 1 coat did give a nice finish but I preferred the look of 2 coats. I then took the Barry M red glitter and painted it down half of my ring finger, I decided to paint the outer half of the nail but you could do which ever suits you. 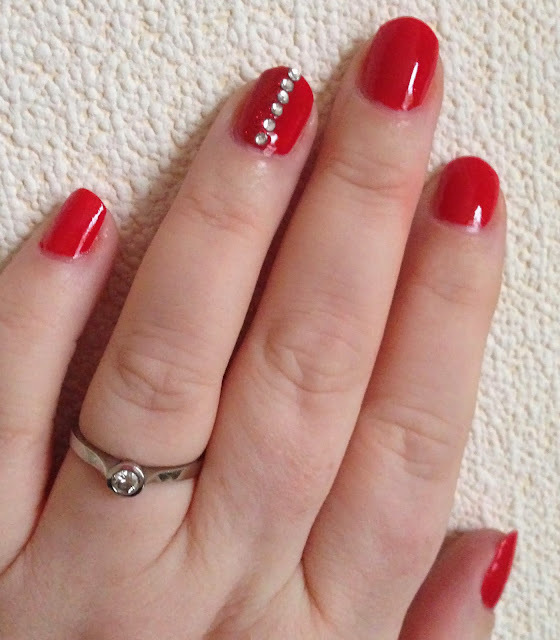 I then applied a layer of Orly glosser top coat, and then placed the diamond type gems in a line down my nail, the gems I have came with a little rubber tipped stick that enables me to pick up the gems but you could use tweezers to do this as I have previously done, it works just as well. Once my gems were where I wanted them I finished the look off with another coat of my Orly glosser top coat to finish the look and also hold the gems in place. Orly Haute Red ~ I love this polish, it is a recent addition to my collection but one I am so glad I bought, it is a beautiful true red with a creamy finish, I love it. I bought mine using a 20% discount code but I would happily pay full price for this or any Orly polish, they come in 18ml bottles which is slightly more than an average polish of 15ml and Orly polishes don't contain any nasties such as DBP, Toluene and Formaldehyde, most polishes free from these things usually sell for at least £14/£15 so Orly are cheaper than most "free from" polishes. Orly polishes apply beautifully and Haute Red is no exception it is lovely, 1 coat and I had beautiful opaque red nails, I did apply 2 coats as I preferred the look as it was more opaque and I liked it better than just 1 but if you were in a rush you could use just 1 coat. I highly recommend this polish, I have been on the look out for a true red polish for a while now and I'm so pleased I picked this up. Barry M Red Glitter ~ I love this polish it is amazing and especially at this time of year, it looks lovely over red polish or on its own as a sparkly red nail look. Barry M glitters are brilliant and they apply so well and the glitter distributes evenly on the nail which is something some glitter polished don't do, and there is nothing worse then applying a glitter polish and having a big blob of glitter on one part of the nail and none in another part. Glitter polishes can be expensive too but the price of Barry M polishes is brilliant, I recently re purchased the red glitter as my current bottle is almost empty but I have had it for around 2-3 years and it hasn't gone gloopy at all, it really is a lovely polish and one I highly recommend. gems in a set from Superdrug, in the set were the gems, a clear topcoat and a little plastic stick with a rubberised tip for picking up the gems, I don't like the top coat that came with the set and never use it so I didn't see the point in photographing something I don't rate, it chips easily and doesn't hold the gems in place. The kit was around £7 when I bought it 3 years ago but it is now more expensive at £10 but you do get over 1000 gems, they are very sparkly and do look lovely, however I found my nail gems on ebay for £1.35 including postage and there are 3000 gems, so a much cheaper option than the Andrea Fulerton there is also a tool to pick up the gems and some glue included. 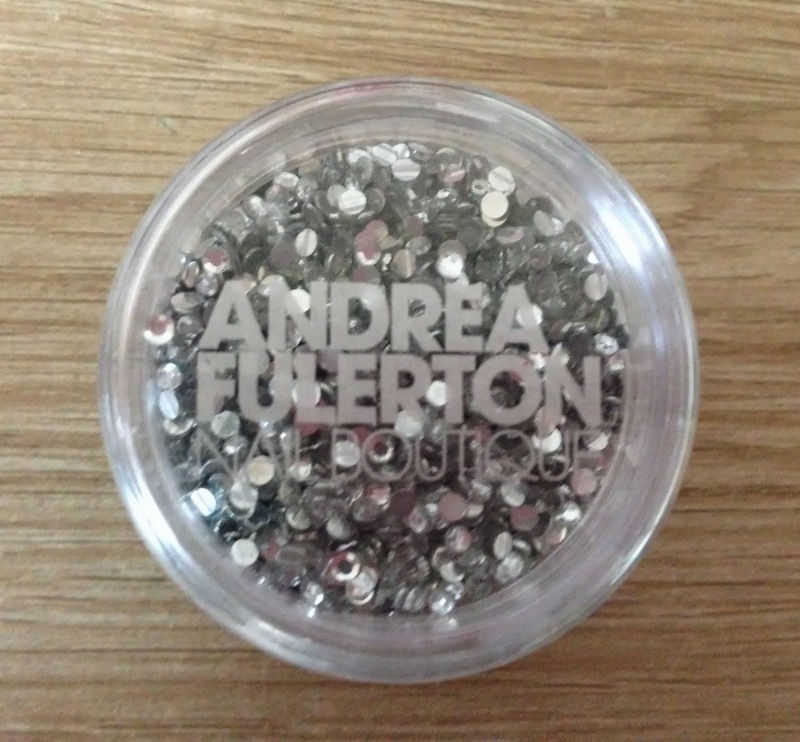 I do like the gems I have and will use them up but next time I think I'll be heading to ebay before Superdrug! If you do re create any of the looks in this series please send me a picture, I'd love to see, you can email me at mammaful@gmail.com or feel free to tweet me @mammafulzo.